Brief appreciations of things Japanese, of the "richness, mobility, and subtlety" of the Japanese "exchange of signs": published in France in 1970, and Barthes at his most seductive. These are the observations of every traveler, translated (without strain) into recognitions. "The dinner tray seems a picture of the most delicate order"; it is actually a palette, "with which you are going to play in the course of your meal. . ." (In the next piece: "by chopsticks, food becomes no longer a prey to which one does violence . . . but a substance harmoniously transferred.") And this sequence of thoughts leads Barthes to remark on the absence of a center, "a precious heart," a deep meaning ("food is never anything but a collection of fragments"). There then comes Tokyo: a city with an "empty" center, the forbidden grounds of the (figurehead) Emperor's palace. 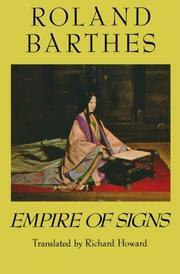 Japan not only affords Barthes a profusion of complex signs, it suites his penchant for the formal--and for non-meaning, the absence of a symbolic charge. "The haiku is not a rich thought reduced to a brief form, but a brief event which immediately finds its proper form." Thus, also, the reflections on bowing; on Bunraku puppets; on the Zengakuren riots ("a great scenario of signs" climaxing in a purely vocal exercise--"The Zengakuren are going to fight"--without a subject or stated cause.) The Bunraku reflections echo the Bunraku piece included by Susan Sontag in A Barthes Reader (p. 621)--where Empire of Signs is lauded but not directly represented. The book is small and, even with 18 black-and-white illustrations, pricey. There is more concentrated pleasure here, however--along with fewer stylistic and other impediments--than in major works of the canon.